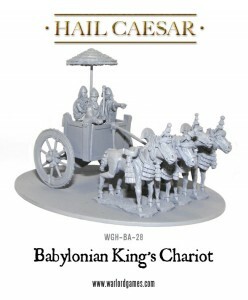 Warlord Games lets you cruise around in style with their new Babylonian King's Chariot. There's also some archers to help blot out the sun. A suitably regal centrepiece for your Babylonian army, this four horse chariot carried the Babylonian king, and his retainers, into battle.